You are browsing the archive for appid_calc.pl. I was recently contacted by Terry O. who spotted and reported a bug in appid_calc.pl which I released back in 2013. After analysis I realized that I made a stupid mistake in the way the parameters were passed to the functions responsible for APPID calculation. Oops. You can download its latest version here. Thanks to Terry for providing the feedback. This is much appreciated. JumpList files are an interesting forensic artifact and as such they have been thoroughly explored by many researchers over last 2-3 years. There is really a lot of material out there and there are also many tools that parse JumpList files’ structure quite well. This is why in this post I will focus not on the content of JumpList files, but on their… file names. and so on and so forth. The data from Forensics Wiki has been harvested from many sources and it’s a very useful reference for further research. Okay, so since it failed and since the algorithm didn’t t seem to be explored in-depth yet I thought I will give it a go. It turned out to be quite simple, but there were a few challenges on the way that may be interesting to know about so I describe it below. I also ended up writing a perl script that I called AppID calculator (appid_calc.pl). It allows you to calculate an AppID based on provided string – more about it below as well. You can find a download link to the script at the bottom of this post. First, let’s talk about the CRC64. There are many CRC algorithms out there. In fact, the difference is not only between the length in bits (CRC16, CRC32, CRC64), but also in the configuration of a particular implementation. There are obviously many standard configurations (Wikipedia described quite a few), but the one used in AppID generation is not on the standard list. I know, because the very first thing I tried was to use all standard configurations, but all of them failed :-). The actual code used by the system relies on a precalculated lookup table, but googling around for the numbers from the table only brought 2-3 hits. In such case, the usual way of solving the issue is to rip the code from the source and reimplement it e.g. in perl. This could be done easily. The 2-3 hits I mentioned earlier refer to a code that was created as a result of reverse engineering of thumbcache.dll file – turns out that the very exact CRC64 configuration/implementation has been used in that DLL. Exploring the properties of CRC I eventually managed to deduce the CRC configuration and the actual polynomial used to generate the lookup table. The polynomial used by the AppID algorithm is 0x92C64265D32139A4. Crc (8 bytes): A bit-reversed CRC-64 hash of the FCIADS stream from the TimeStamp field to the end of the structure that can be used to validate the integrity of the FCIADS stream. The cyclic redundancy check (CRC) polynomial is x**64 + x**61 + x**58 + x**56 + x**55 + x**52 + x**51 + x**50 + x**47 + x**42 + x**39 + x**38 + x**35 + x**33 + x**32 + x**31 + x**29 + x**26 + x**25 + x**22 + x**17 + x**14 + x**13 + x**9 + x**8 + x**6 + x**3 + 1, with the leading 1 implied. The normal representation is 0x92C64265D32139A4. That was a good sign and I could now start implementing the appid calculator w/o ripping the lookup tables. The second issue to solve was the normalization. The paths are normalized using KNOWNFOLDERIDs, so it’s a simple search and replace before applying the CRC. One aspect of normalization I need to mention is… ambiguity. Depending on the OS (32 vs. 64 bit) different KNOWNFOLDERIDs are applied during the normalization path and it’s quite confusing. I suggest reading the Microsoft page I linked to above for further details. For this reason, attempting to find e.g. 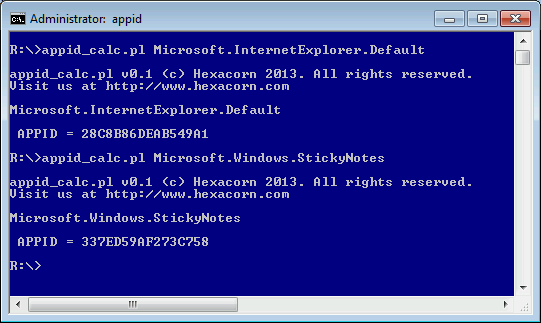 AppID of c:\program files\Internet Explorer\iexplore.exe doesn’t really make sense as all IE windows are grouped under Microsoft.InternetExplorer.Default AppID. You may notice that in this example there are 2 different AppIDs shown. This is because of the ambiguity I mentioned earlier; applications running on 64-bit systems can be executed in more than one configuration and since there is WOW64 folder redirection happening AppID needs to be calculated in a context. if 64-bit, the AppID is 9B9CDC69C1C24E2B. It gets even more complicated with Program Files folder as it has two versions – with and without (X86) and 32-/64- bit applications both ‘see’ Program Files the same way. As an example we could try to generate a hash for Internet Explorer in various configurations by running appid calculator and providing to it a path to c:\Program Files\Internet Explorer\iexplore.exe. As mentioned earlier IE uses an AppID that it sets up during the launch, so you should never see AppIDs shown on the screenshot below, but it is a simple example to show various configurations of Program Files folder using a well-known path. Again, I strongly suggest reading the Microsoft Article about KNOWNFOLDERIDs, The appid calculator provides a link to it as well if the path is known to be ambiguous (system32, program files, program files\common). You can find the script here. This is a first version, coded in a hurry so it may contain bugs. If you find any issues, please let me know. Thanks!